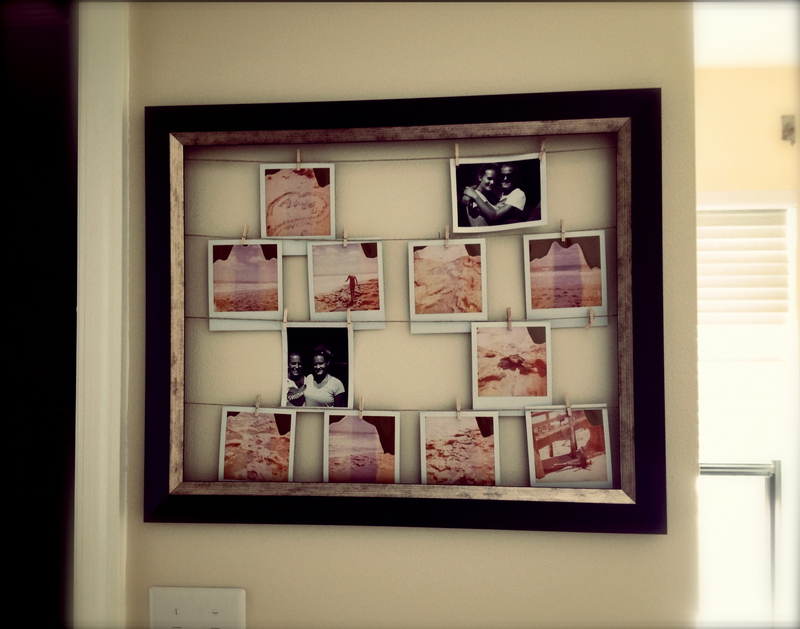 I originally wanted to build this project from scratch and make my own frame out of driftwood I found on the beach. However, after realizing it takes A WHILE to find the right pieces you need, I decided to buy a low priced, pre built frame for a quick easy project. I took out the glass and backing, and all that I used was the actual frame. I then staple gunned hemp rope to the back of the frame. After that, I hung the individual pictures with mini clothes pins to give it a country feel. For the pictures I used some old polaroid film my Dad had laying around. The film expired in 2003 so I wasn’t sure how they would come out, but they ended up coming out pretty interesting. Each picture had a sepia look to it with different colors coming through. I wanted to use polaroids because they are a heavier picture and won’t curl up as easy. If you do not have a polaroid camera you can use any other standard picture type. You will want to use more clothes pins on the corners at the top, and even on the bottom, to prevent any curling (black and white photos below). I’m really happy with the way this project turned out. My style totally came through with the laid back country feel and the neutral colors. I got all my supplies at a local Michaels and it was real quick and easy to put together! Let me know if you try it out!